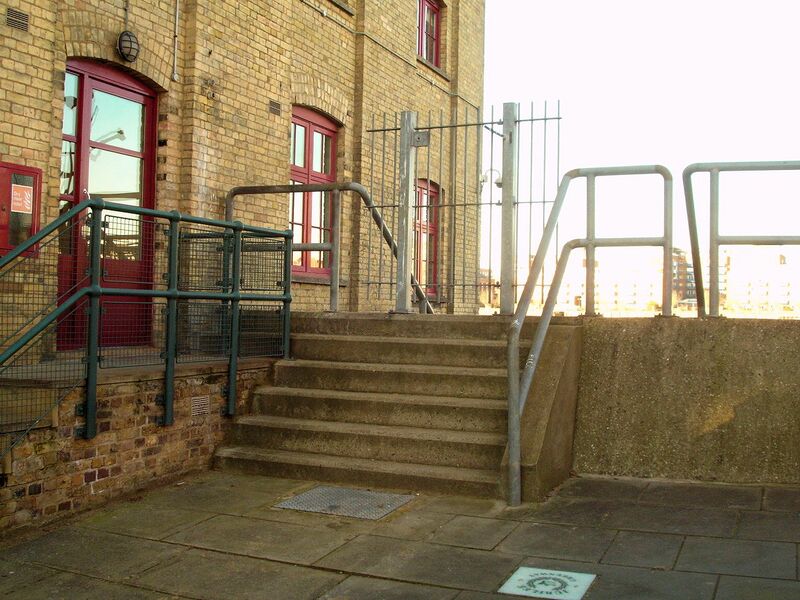 Globe Wharf has retained its name, though the building itself has been converted into apartments, and the stairs are directly on the downstream side. There is a modern metal gate and the steps are in good condition, very broad, with strong hand-rails. Below in the immediate vicinity of the steps you’ll find a large area of sand, changing to gravel lower down. Here is the view from the steps looking upstream and this was as far as the beach went for that particular low-tide (1.2metres) cut off by the water after about 100 metres as the river continues to bend around Globe Wharf. In the other direction though it was possible to walk as far as Pageant Stairs and, presumably, to Cuckold’s Point (Horn Stairs). There are none worth noting .. in fact this could almost be a family beach (similar to that surrounding Horn Stairs at Cuckold’s Point a little downstream). There’s a large area of sand, becoming gravel lower down towards the water. The exit stair can be kept easily in site if one doesn’t venture far downstream. This is a section from a very detailed (25inch to the mile) Ordnance Survey map of London first started in the 1850s, but continuing with revisions into the 1870s (click to enlarge). This one was surveyed in 1868. So the map series shows the areas still at the height of their Victorian industrialization, just prior to the beginnings of decline for the docklands. Along the beach is the last part of ‘Redriff’, a former name for the area. The ‘Horseferry Stairs’ labelled no longer exist, no doubt in part because the area was bombed heavily during WWII and much of the riverfront had to be rebuilt. 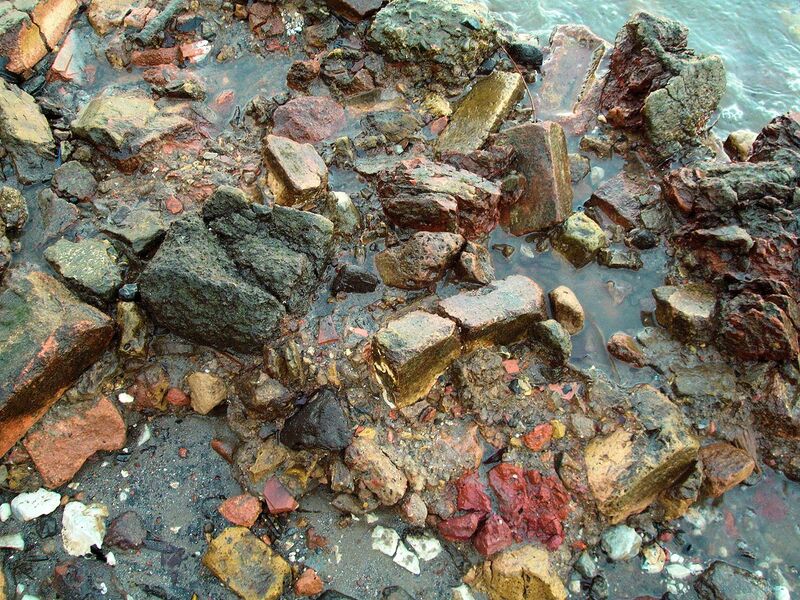 For centuries Rotherhithe was a busy port area, inhabited by ‘the seafaring’, a centre for ship-building, ship and barge repair etc., and further upstream towards Bermondsey the foreshore is littered with ship’s timbers. 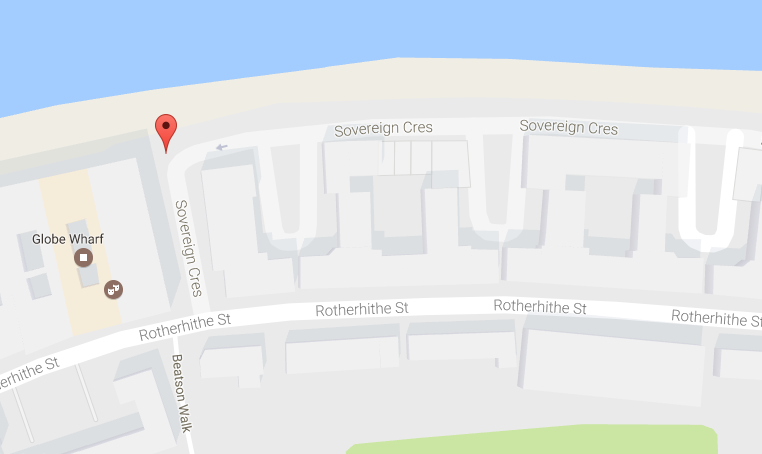 It’s in the name .. ‘Rotherhithe’ possibly coming from the Anglo Saxon words ‘redhra’ meaning ‘mariner’ and ‘hyth’ meaning ‘haven’. The Mayflower sailed from here ( nearby marked by the ‘Mayflower’ pub ) in 1620 to Southampton before departing for New England. In John Gay’s The Beggar’s Opera 1728 Mrs Peachum speaks of ‘our warehouse at Redriff among the seamen’. So Rotherhithe has always had multi-cultural connections due to visitors settling and the trade relationships across the globe. Nearby Canada Water gets its name from the timber trade ( on the above map Globe Wharf is sub-titled ‘Timber Yard’ ) and in addition to well-known Scandinavian and Baltic connections, Rotherhithe has developed the largest Chinese population in this part of London. 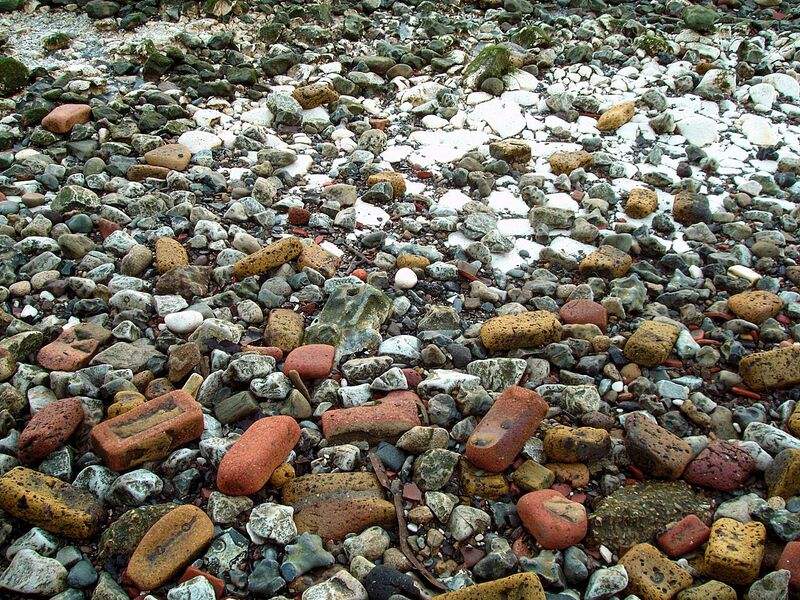 What that means in terms of searching the foreshore is that, really .. you could expect just about anything from any part of the world! That applies to the whole of the Thames foreshore, but perhaps never more so than here. It’s also worth noting this area’s proximity to Wapping directly on the other side, which is one of the most popular ‘mudlarking’ sites. However! .. when I visited this particular part the first time my first thought was that I wouldn’t be staying long .. I was just gazing at stone-after-stone without much else of interest. Either side of the central sand & gravel area (mainly upstream) there is more interesting larger shingle, but that’s all there is .. there are no ‘historical mud’ areas at low tide. 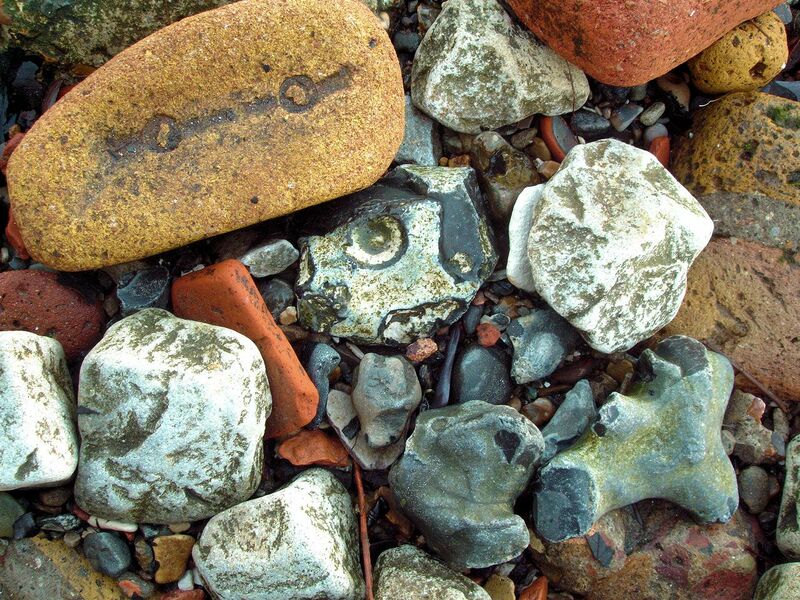 Things did become a bit more animated after a few minutes walking downstream though, and I even found my first piece of ‘Bellarmine’ with the remains of a face! 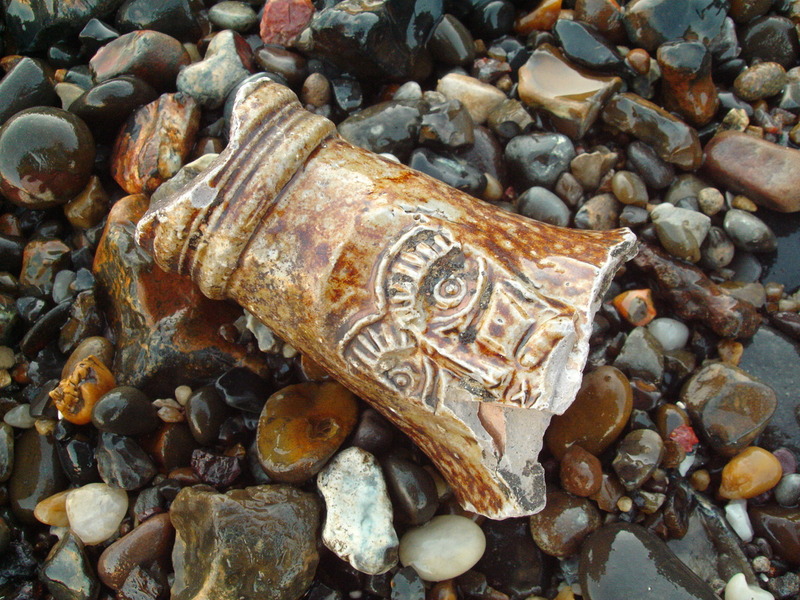 This piece includes part of the bearded-face emblem from a type of stoneware bottle/jug ubiquitous throughout the 16th-17th centuries known either as a Bartmann or ‘Bellarmine’ jug, manufactured mainly in Germany. 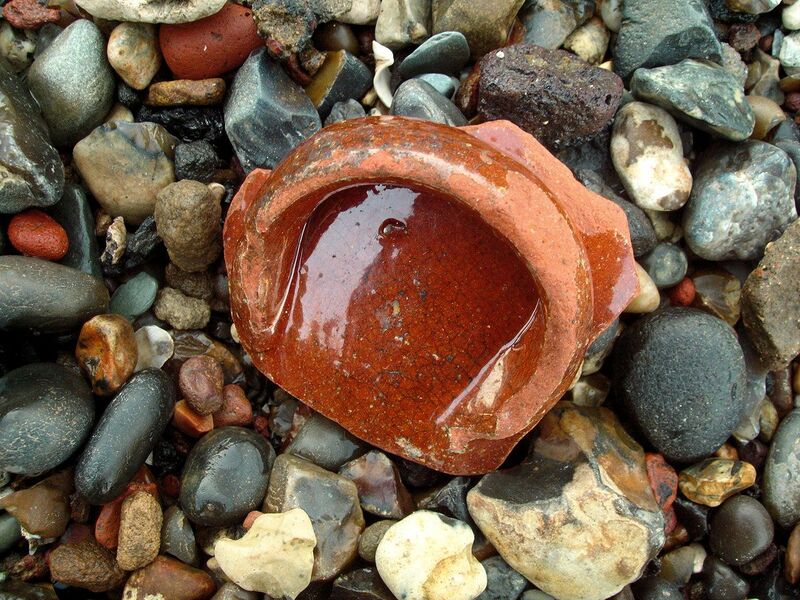 Soon I saw other pottery fragments .. for example there were, as expected, a number of pieces of late Victorian stoneware bottles, some even with ‘Rotherhithe’ on them and another with ‘Ginger Beer’. 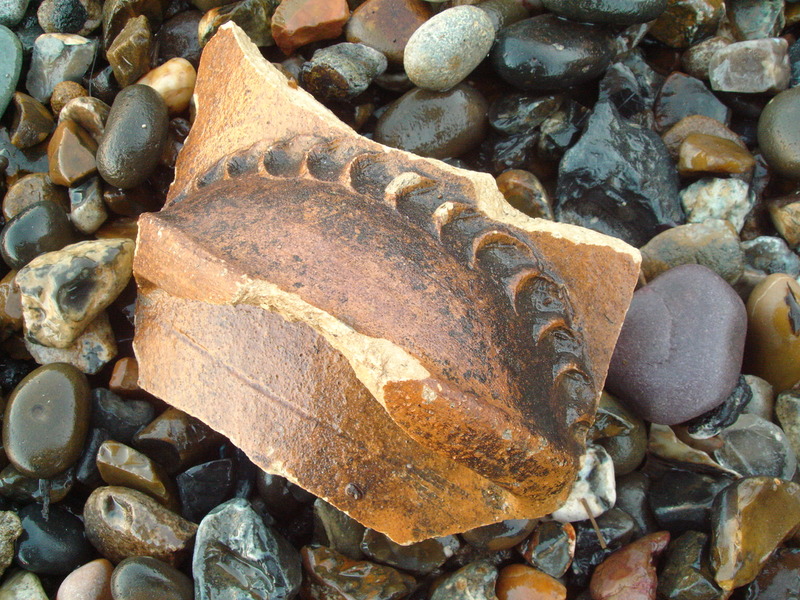 This ‘handle’, about 12cm wide from a large vessel, was interesting mainly in the way the clay had been fixed to the body form. I vaguely remember I’ve seen a similar technique on a piece of medieval pottery but I can’t remember where. I’m assuming the handle is like this for extra strength because it belonged to a storage vessel but that’s all I can say. I hadn’t seen shape of handle before .. at least, not until just 5 minutes earlier when I came across this smaller red one. 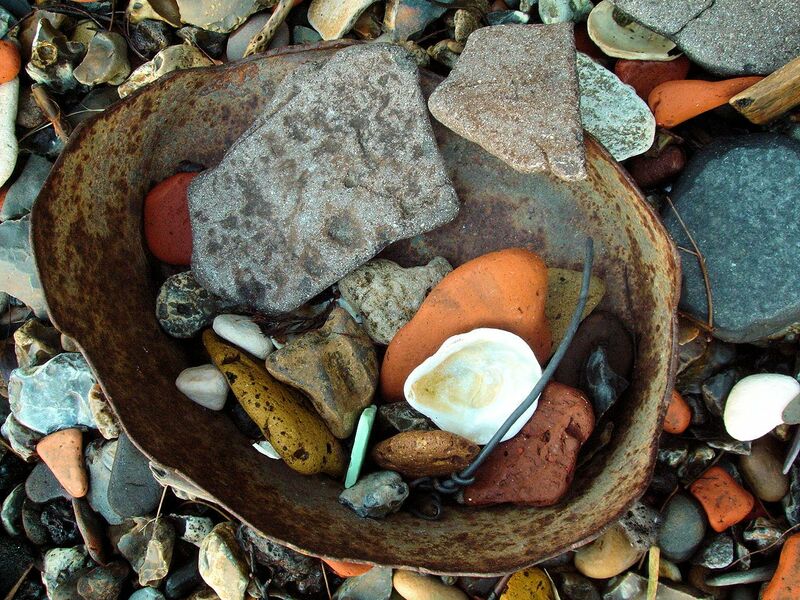 Once again there was that feeling of the ‘not entirely coincidental’ that one gets an awful lot on the Thames Foreshore! 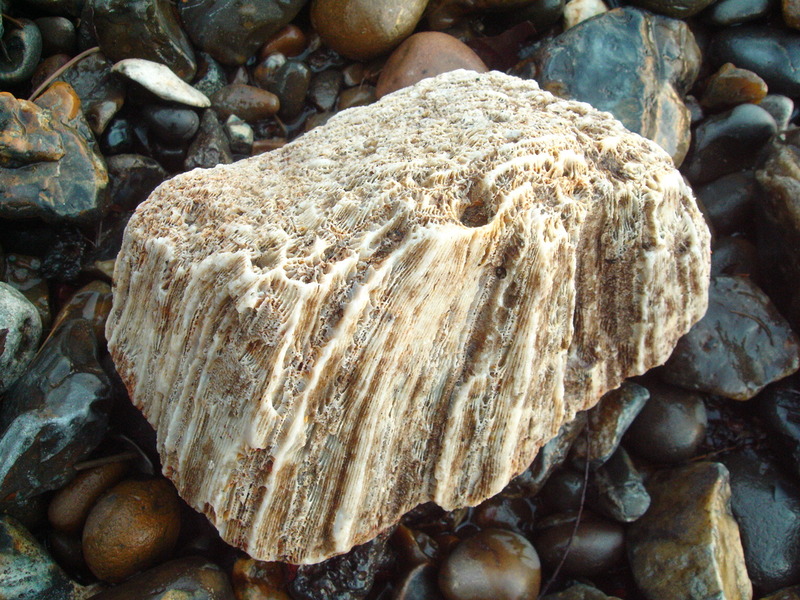 There were also a few large (this c16cm) pieces of coral like this one, apparently often found in Rotherhithe. 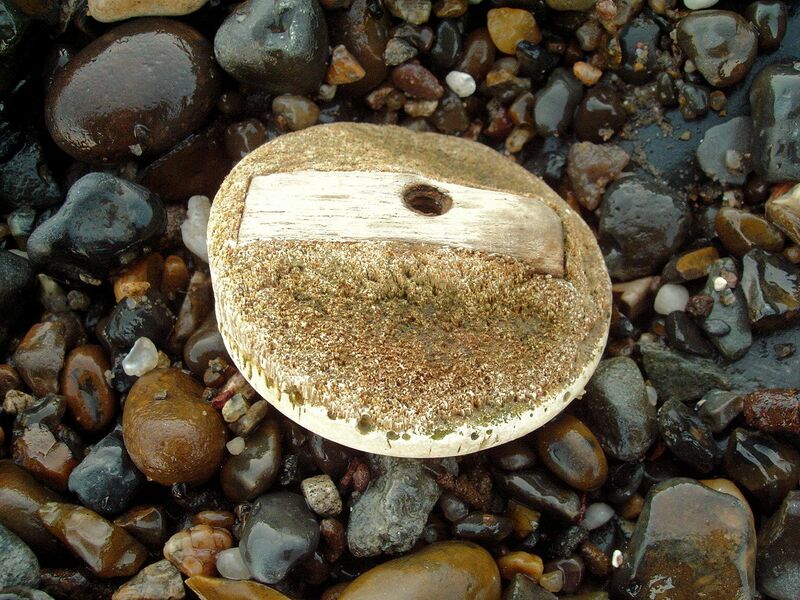 According to Lara Maiklem ( london.mudlark ) these most likely came in the ballast offloaded by visiting ships and could originally come from the Caribbean. 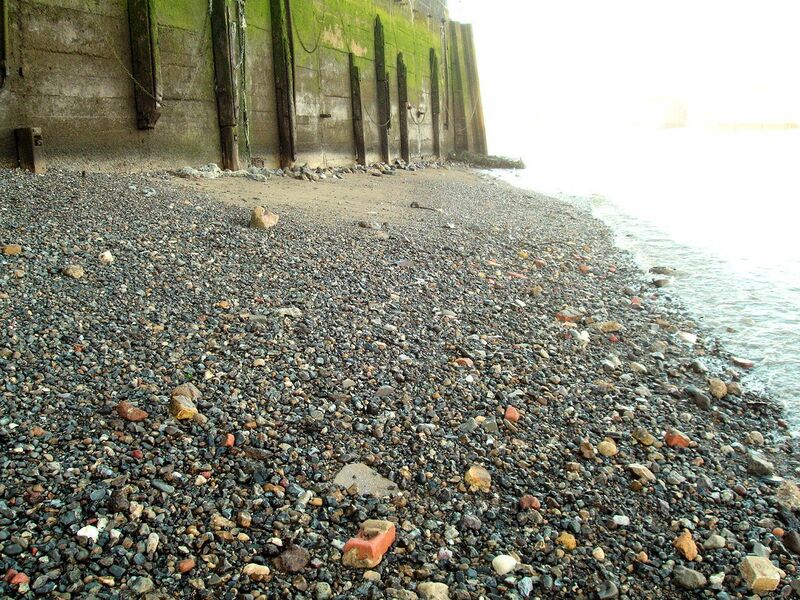 I’ve found some smaller, more pebble-worn pieces before, further downstream at Deptford. So by this time I’d realized that having to search a ‘plain and uneventful beach’ was by no means a bad thing! If there’s not much going on visually it means that anything ‘out of the general’ stands out more and it was also, in a way, much more relaxing! Perhaps worth noting is that there are relatively few animal bones compared to some other areas, though I did see some quite big ones. This may support the theory that material of similar weight collects in different areas according to their positions on the river bends. 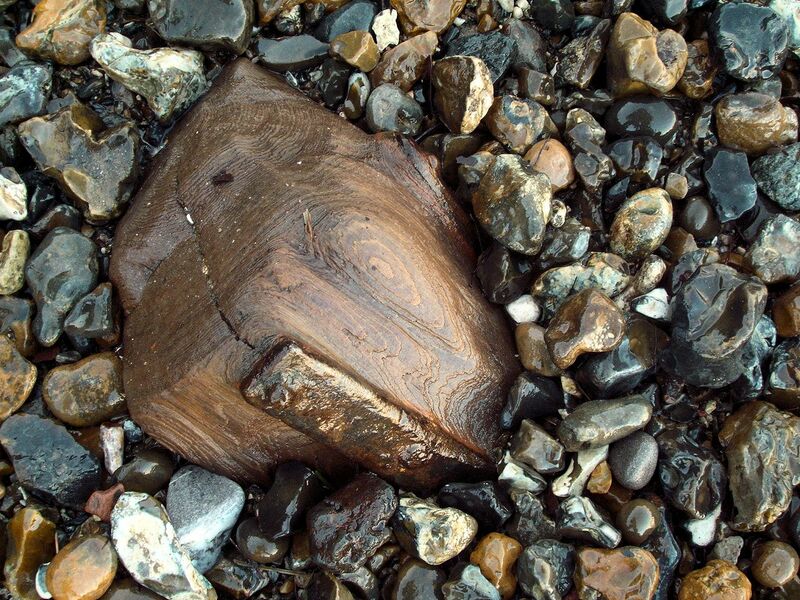 For example Greenwich has a great many bones of all sizes especially in the Greenwich Power Station area. This is at the centre of the outer side of a curve whereas Globe Stairs is at the beginning of an inner one. 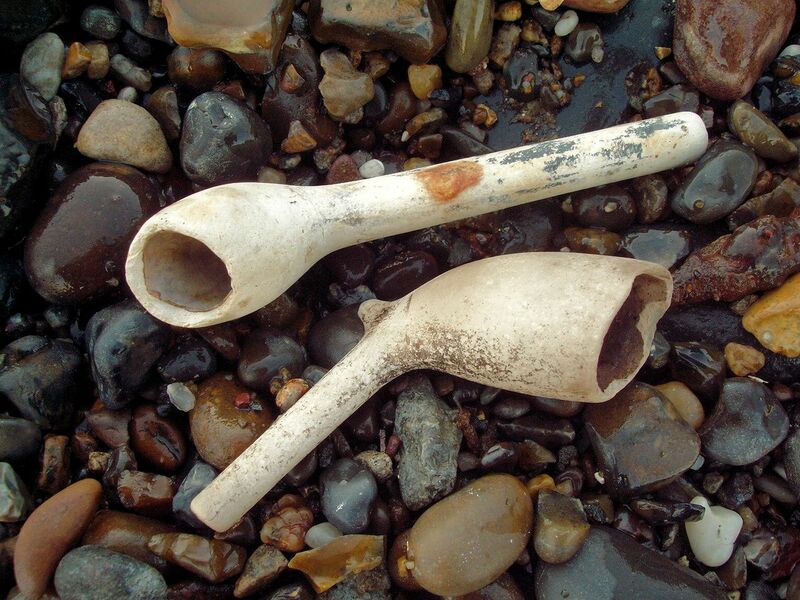 If you’d like to pick up a piece of pipe or two then this is not really the beach for you! I noticed very few ‘tell-tale’ stem fragments as I was looking around and all were quite worn, as if .. just a guess .. they’d all migrated slowly from the opposite bank Wapping where I’ve been told they’re plentiful. I was actually very surprised to find these two .. the one above is early 18th century while the one below is more probably mid 19th. 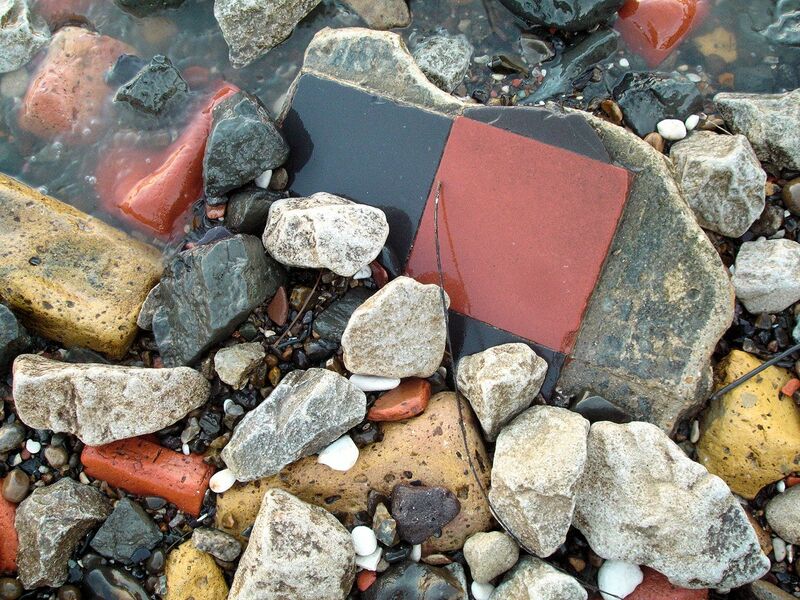 But the ‘mystery’ objects are by far the best, partly because one’s bound to learn from them, even if it is only to wonder how skilfully the Thames can make the ‘modern’ look so ancient! 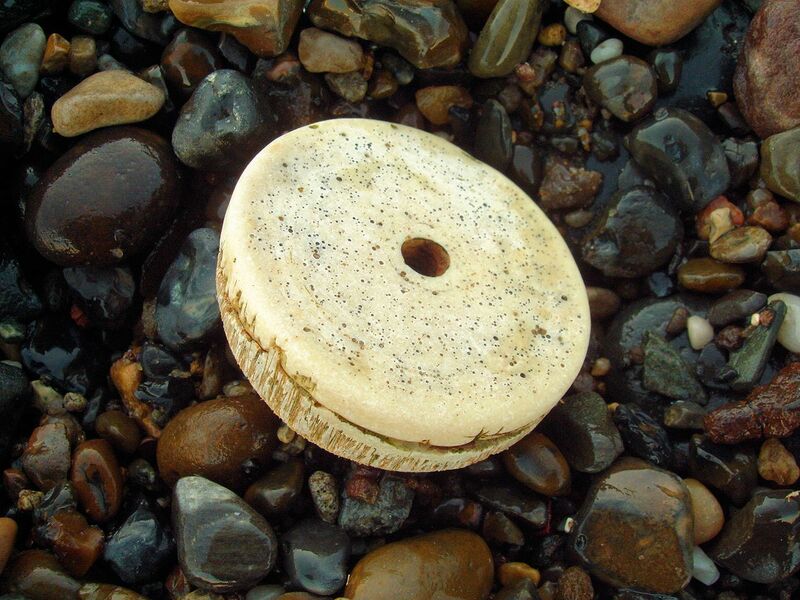 The material of this 5.5cm diameter ‘wheel’ form is at least an ‘ancient’ one though, either bone or ivory, and I’m going for ivory because I think bone darkens more in the Thames judging by the animal bones. My first thought was that it was from some form of toy but the wooden insert on the reverse side is very expertly fitted and a thin metal threaded tube is in turn fitted into this .. it seems like a lot of craftsmanship for just a toy. So my second thought was that it may come from something ceremonial. It’s stretching what little there is to go on but there’s just a chance this could come from one of these .. a Tibetan prayer wheel, 19th century, courtesy of cambiaste.com. 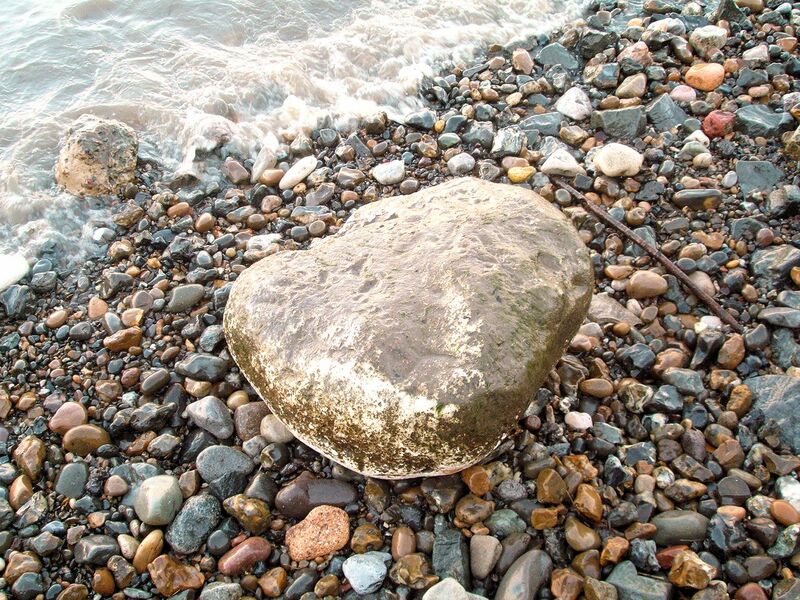 It’s unusual to see such large boulders perched like this at the water’s edge .. proof of the power of the water to move even these. What ‘mud’ there is further downstream near to Pageant Stairs is so chock-full of building rubble that there’s nothing else to be seen in it. The ‘dry’ part nearer the wall here is also just a clutter of London bricks so it’s likely that this is one of those foreshore areas into which house rubble from WWII bombing was dumped. 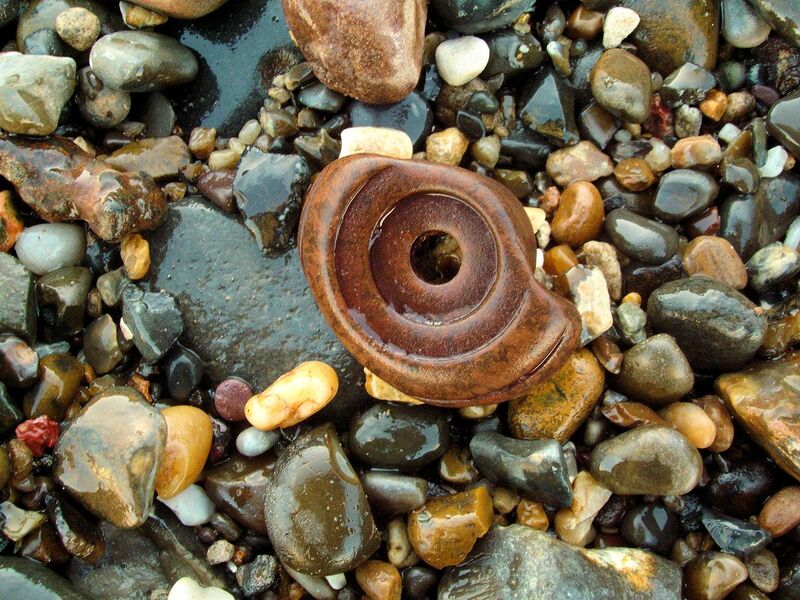 .. and possibly connected, I noticed quite a few pieces of old ‘Bakelite’ appliance knobs throughout this stretch.